Our Security Cabins are manufactured with quality raw materials where we can meet the customers demand and we also manufacture the security cabins as per the customers requirements.These cabins are manufactured in two materials like M.S(mild steel sheet) and ACP Sheet. You can use these security cabins for security purpose at construction site, company premises, schools and colleges security, events security and watchman’s cabins. Commercial, industrial, institutional, governmental, or residential facilities, Guardhouses are generally placed at the entrance as checkpoints for securing, monitoring and maintaining access control into the secured facility. In the case of small to mid-sized facilities, generally the entire physical security envelope is controlled from the Guardhouse. Guardhouses are manufactured with welded, galvanized steel construction, insulated, include heat and light, have 360 degree visibility, and can also be bullet resistant. These guardhouses keep security guards comfortable as well as secure. We are engaged in fabricating a wide range of portable cabins that are offered in various forms. Available in variety of colour, sizes, patterns & also as per client’s specifications of construction, our panels enable us to offer variety in office cabin design & construction. We cater to construction companies, solar projects etc. with our range of portable cabins/office cabins. Official Portable Cabin is a building designed and built to be movable rather than permanently located. The most familiar modern type of portable buildings are designed so that one can be carried to or from site on a truck and slung on and off by a crane. Office Cabin TECHNICAL SPECIFICATION SI NO	COMPONENT	DESCRIPTION 01	Bottom Frame	100mmx50mm G, C Channel & pipe ISI Marked. 02	Top Frame	50mmx50mm Ms Square Pipe ISI Marked. 03	Stiffener Bottom	75mmx40mm C channel Angles & pipes ISI Marked. 04	Stiffener Top	40mmx20mm MS square pipe ISI Marked. 05	Side Post	50mmx50mm Ms square pipe ISI Marked. 06	Side Wall Stiffeners	Specially formed CR sheets of make TATA / Jindal. 07	Paneling Outside	Specially formed CR sheets TATA / Jindal. 08	Internal Wall Paneling	8mm OSL MDF of make Leo Classic. 09	Roof Outside	Jindal CR sheet of 1.2mm thick properly sloped & water tight. 10	False Ceiling	8mm OSL MDF- Plane White of make Leo Classic. 11	Flooring	18mm Bison Panel with Vinyl carpet. 12	Aluminium Windows	Sliding Aluminium Powder Coated Windows With 4mm Glass. 13	Door Ms door with holder draft & handles. 14	Insulation	50mm glass wool insulation on wall & 25mm on ceiling. 15	Wiring	All wiring of concealed type & PVC insulated copper wire. 16	Electrical Fittings		All electrical fittings in portable cabin shall be 220-240V.AC 50Hz. 	Tubes, Bulkhead, Fan, switches, Sockets & Telephone. 	Air conditioner point (MCB) (All type of window Air conditioning Systems as desired upon can be Installed polycab wire. 17	Earthing Earthing point will be provided for safety. 18	Outside Painting	1 coat of Epoxy primer with 2 coats of Epoxy Paint. 19	Hooks	Specially formed hooks for easy lifting and shifting. Bunk Houses offer you a short-term solution for easy and compatible placement with the advantage to be very instantly movable. AM Office Solutions offer a variety of bunk houses required for different needs ranging from business to personal. Situations overall we have something for all. We are specialized in building up custom bunk houses, where you get your desirable kind of bunk houses on the basis of changing conditions. We believe in quality design with premium grade material at the best budget. We also aim to keep the cost at a very effective range so that there is scope for minor changes as per change in requirements. AM Office Solutions is operating in the field of manufacturing bunk houses for a long time, due to which we have gained valuable experience in building quality structure. The offered products are of premium quality and require less maintenance. Being a flexible structure it is easy to transport whenever required. We also ensure that the material used for its construction gives a very long life to the structure. Designed in a way to withstand all weather condition and offers highly insulated design. We have emerged as one of the most experienced and well-developed companies in the production of Farm House. Our clients can avail from us an extensive range of superior quality Prefabricated Farm Houses. Widely known for excellent accommodation and sturdiness, our offered houses are built using top-notch components. These houses are designed as per the defined industry standards by our highly qualified professionals using the excellent quality raw materials. AM Office solutions are known for their sophisticated design, unique pattern and fine finish. To ensure its unique design and easy installation, our constructed farmhouses are well tested against various quality parameters by our quality experts. Further, our esteemed clients can avail farmhouses as per their varied needs at the most affordable price within the stipulated time frame. Our designed Farmhouses are easy to relocate and highly secured. The construction material is selected to provide optimum strength. Elegantly textured with long-lasting glass fibre wall panels. For stability and strength, stainless steel structural framework is used which can withstand any weather conditions. These Farmhouses are maintenance free equipped with Dust Proof doors and windows with SS mesh & grills. In addition to the constructional features, we also equip the farmhouses with ISI marked concealed electrification & plumbing. 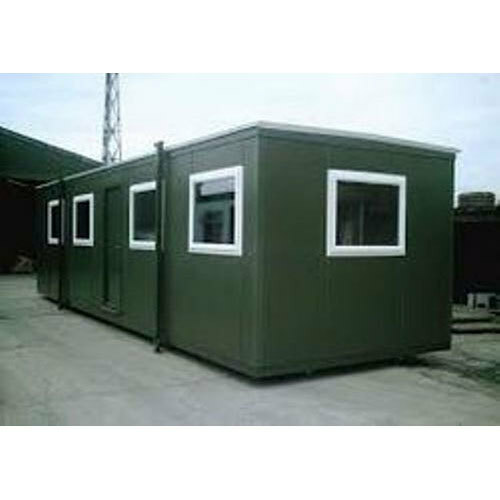 Portable Office Cabin Technical Specification : We acknowledge with thanks the receipt of your enquiry and are very pleased to quote the best offer as detailed below: Specification of office: 1. Container Dimension – 20’ (length) x 10’ (width) x 8.5’ (height) 2. Floor- MS Structure with M.S pipes, angle & channel weld together + Bison ply board (mixture of cement & wood) 18 mm + 1.0 mm vinyl carpet. 3. Walls – MS Structure + 1.4mm Profiled MS Sheet + 25mm Thermocol Insulation + 25mm of glass wool+ pre-laminated MDF Board of 9mm. Walls are designed to absorber Heat and noise. 4. Roof – MS Structure + 1.2mm Profiled MS sheet + 50mm Glass wool insulation + pre-laminated MDF Board 9mm. Roof are designed to absorber Heat & also with proper sloping and gutters to run water while raining. 5. Doors – One door 3’x 6’with 1.4mm Profiled MS Sheet + 25mm Glass wool insulation + pre-laminated MDF Board with canopy. 6. Windows – Three4’x 3’ powder coated two track Aluminium windows on MS Frame with safety grill and canopy. 7. Electrical– All Electrical wiring are done with 3 wire (phase, neutral & earth) with 2.5sqmm wire .Fittings for 3 tube lights 1x40w with wiring of 1.5sqmm, 2 cabin fans with switches. 16Amps for A/C & 6Amps plug points, 1 bulkhead light outside & 2 MCB. 8. Painting – Metal priming everywhere to with stand rust + Enamel painting exterior – 2 coats. Portable Office Cabins Designs We have portable office cabins are designed to be comfortable and secure which are designed with premium quality raw materials that ensure a long service life. Innovative and customized designs of these office spaces provide the best solution to your specific office needs. Chosen from a wide range of fabulous cabin designs to suit your purpose in the best way possible.